Thomas Reid (April 26, 1710 – October 7, 1796), Scottish philosopher, and a contemporary of David Hume, was a founder of the Scottish School of Common Sense, and played an integral role in the Scottish Enlightenment. His work is sometimes described as constituting one of the two great responses to the skeptical challenges of David Hume (the other being the work of Immanuel Kant). Reid advanced a set of views that hinged on what today is called 'default justification.' We are wrong, Reid claimed, to think that we need some philosophical argument in order to be justified in relying on our senses, on certain moral principles, or on the fundamental principles of reasoning. Rather, we are automatically justified in such reliance. The chief error of Hume and many of his predecessors, Reid believed, was to think that if some tenet of common sense could not be justified by argument, then it was not justified at all. Such attempts were then not only unnecessary, but pernicious. This approach surfaces in most of the many topics on which he wrote, including perception, epistemology, free will and ethics. Though Reid's views have generally been overshadowed by those of his contemporary Kant, his work influenced a number of twentieth-century philosophers, including G. E. Moore's work on skepticism and R. M. Chisholm's work on sensations, and more recent years have seen a significant increase in interest in his theory of perception. Thomas Reid was born in Kincardinshire, Scotland on April 26, 1710, (exactly one year before David Hume, who would begin his philosophical career much earlier in life). Reid's father, Lewis Reid, came from a family of clergymen and government official of moderate importance. His mother's family, the Gregorys, were a well-respected intellectual family (Reid's uncle David, an astronomy professor at Oxford, was a close acquaintance of Isaac Newton). Reid studied at the University of Aberdeen, in the Marischal College. While there, and while serving as a librarian after graduating, Reid studied mathematics, and closely studied Newton's Principia. He left Marischal in 1736, and the following year entered the ministry at New Machar. Three years later, he married his cousin Elizabeth. Reid did not write his own sermons, instead beginning to work on developing his philosophical views (having read the work of Bishop George Berkeley, as well as Hume's masterwork, the Treatise on Human Nature when it was published in 1739). Reid's first publication, in 1748, was entitled, "An Essay on Quantity, Occasioned by Reading a Treatise in Which Simple and Compound Ratios Are Applied to Our Ideas of Beauty and Virtue." Indicating the direction his later philosophy would take, the aim of this essay was to argue against the application of mathematical methods to aesthetics and ethics. Despite having only one publication, Reid developed a reputation that led to an appointment as Professor of Philosophy at King's College at the University of Aberdeen in 1752. He lectured in mathematics, physics, logic and ethics, and founded the Aberdeen Philosophical Society. The Society served as a focal point for various proponents of common-sense philosophy (including James Beattie). The papers that Reid presented to the Society were eventually published in 1764 as his first major philosophical publication, An Inquiry into the Human Mind on the Principles of Common Sense. Hume was shown a copy of the manuscript of the Inquiry, and wrote to Reid that he found the work impressive and challenging. That same year, Reid took up the position of Professor of Moral Philosophy at the University of Glasgow, a position formerly occupied by Adam Smith. There, his philosophical productivity increased, and Reid eventually resigned the position so as to focus on his work. In 1785, he published the Essays on the Intellectual Powers of Man, followed in 1788 by the Essays on the Active Powers of Man. With the publication of the latter, Reid's activity slowly began to wane. He died peacefully in 1796.
very ingenious men, such as Des Cartes, Malebranche, Arnauld, Locke, and many others, have lost much labour, by not distinguishing things which require proof, from things which, though they may admit of illustration, yet, being self-evident, do not admit of proof. When men attempt to deduce such self-evident principles from others more evident, they always fall into inconclusive reasoning: and the consequence of this has been, that others, such as Berkeley and Hume, finding the arguments brought to prove such first principles to be weak and inconclusive, have been tempted first to doubt of them, and afterwards to deny them. Today, Reid's best-known application of this approach concerns perception, but he extended to it a wide variety of other issues as well. In every case, Reid resists any philosophical attempt to undermine something common-sensical. Given the scope of Reid's writings, it is not possible to review all of his claims. Instead, we can focus on three of the topics for which Reid is best known: perception, causation, and the foundations of morality. As Reid understood it, many of his seventeenth and eighteenth-century predecessors (the clearest case may be Locke) had accepted a view along the following lines: in perception, external objects such as rocks and cats causally affect our sense organs. The sense organs in turn affect the (probably, non-material) mind, and their effect is to produce a certain type of entity in the mind, an 'idea.' These ideas, and not external objects, are what we immediately perceive when we look out at the world. The ideas may or may not resemble the objects that caused them in us, but their causal relation to the objects makes it the case that we can immediately perceive the objects by perceiving the ideas. Reid noted that, as soon as this picture is in place, the question naturally arises as to just how far our ideas might diverge from their causes. Indeed, it begins to seem that we are completely cut off from reality, stuck behind a veil of ideas. This is a counter-intuitive conclusion, and Reid thinks it indicates that the original positing of ideas, as things we perceive that are distinct from the objects was misguided (here, the view echoes that of Antoine Arnauld in his debate with Nicolas Malebranche). Common sense, he argues, dictates that what we perceive just are objects and their qualities. Ideas, then, are a philosopher's fabrication. Reid's picture, however, is more complex than such general statements of it may suggest. For Reid continues to accept Locke's distinction between primary and secondary qualities of objects. Locke held that, among our ideas of objects, some (such as shape) do resemble qualities of the objects that produce them, while others (such as color) do not. Of course, Reid cannot accept the distinction in those terms, so he does so in terms of 'sensations.' When we perceive objects, Reid claims, we find in ourselves certain sensations. Sensations are the effects of the causal influence of objects on us, and these are what lead the mind to perceive the object. Yet sensations themselves, being feelings, cannot resemble their objects (in this, Reid echoes Berkeley's famous claim that nothing can be like an idea except another idea). When, for instance, we perceive though touch that some object is hot, we feel a certain sensation. We know that feature of the object caused us to have that sensation, but we may not know anything about the feature other than that (unlike the case of the extension of the object, which we perceive directly). The feature of the object which produces the sensation of heat is a secondary quality, and all other secondary qualities are individuated in the same manner: via some sensation we have. 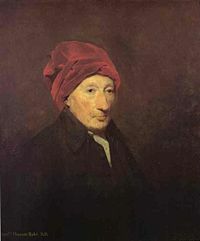 One of Hume's most famous claims (argued for both in the Treatise and in the Enquiry Concerning Human Understanding) was his assertion that our only conception of causation was of the constant conjunction of two types of event, accompanied by some feeling of expectation on our part. In particular, we have no true conception of the sort of objective quality Locke called 'power'—a feature of an object in virtue of which it necessarily produced certain effects. The starting point for Reid's moral views, unsurprisingly, is again the powerful theories of Hume. Hume staunchly defended the empiricist claim that all of our concepts originate in either external sensory impressions, or else in the awareness of our own minds and sentiments. He traced moral concepts to certain feelings of approbation and disapproval that we feel when we perceive when we see others acting in certain ways. As Reid interprets him, Hume's position is what is today is called 'emotivism'—the position a moral judgment like "That action was wrong" does nothing more than express our disapproval of the action (and so might be equivalent to "Boo!"). Reid held that Hume was right in thinking that there certain feelings of approval and disapproval that accompany our moral judgments. But Reid denied that these feelings were the source of our moral thinking. Rather, common sense provides us with a wealth of fundamental moral principles (some as specific as, "unmerited beneficence to those who are at ease should yield to compassion to the miserable" and "unmerited generosity should yield to gratitude, and both to justice" - see Essay five of Active Powers). When, in judgment, we apply these principles to particular cases, those judgments are typically accompanied by the feelings Hume described, but Hume had the causal explanation backwards. The feelings do not cause the judgments, rather, the judgments cause the feelings. Reid takes this to be supported by introspection, where we often find ourselves judging that something was wrong before disapproval starts welling up inside of us. In addition, Reid specifically attacked the suggestion that what is meant by moral judgments is that the judger is having a certain feeling. For one, he noted that when we morally condemn or approve of some action, we take ourselves to be ascribing some property (badness or goodness) to the action, not to our selves. For another, if the emotivist position were correct, then most moral disagreements would become absurd. When one person asserts that some action is good, and another asserts that it is bad, they would be wrong if they take themselves to be disagreeing. All that is going on in such a case, according to the emotivist, is that each is simply expressing his or her own feelings about the matter. It would then be absurd for one to claim that the other is wrong, for who could be more authoritative about what a given person is feeling than the person having the feeling? These consequences, Reid argues, show that emotivism is far too implausible to be accepted. The Works of Thomas Reid, Sir William Hamilton (ed. ), Edinburgh, 1846. Reprinted by G. Olms Verlagsbuchhandlung, Hildescheim, 1983. Essays on the Intellectual Powers of Man, Derek Brookes (ed. ), Pennsylvania State University Press, University Park, 2002. Essays on the Active Powers of the Human Mind, Baruch A. Brody (ed. ), Cambridge: MIT Press, 1969. An Inquiry into the Human Mind on the Principles of Common Sense, Derek R. Brookes (ed. ), University Park: Pennsylvania State University Press, 1997. Inquiry and Essays, Ronald E. Beanblossom and Keith Lehrer (eds. ), Indianapolis: Hackett, 1983. Barker, Stephen F. and Tom L. Beauchamp (eds.). Thomas Reid: Critical Interpretations, Philosophical Monographs. 1976. Daniels, N. Thomas Reid’s Inquiry: The Geometry of Visibles and the Case for Realism. Franklin, New York, 1974. Ellos, William J. Thomas Reid's Newtonian Realism. Lanham, Maryland: University Press of America, 198. Gallie, Roger D. Thomas Reid and 'the Way of Ideas. Kluwer, 1989. Lehrer, Keith. Thomas Reid. Routledge, 1989. Rowe, W.L. Thomas Reid on Freedom and Morality. Ithaca, NY and London: Cornell University Press, 1991. This page was last modified on 4 December 2015, at 00:03.